Australia is a unique country, a hospitable and extraordinarily beautiful land that keeps true riches, including rare natural phenomena, as well as amazing representatives of flora and fauna. The natural sights of Australia amaze with its beauty. The untouched nature here contrasts with the most modern megacities. Lovers of diving and golf come here from all over the world, and lovers of adventure again and again follow the routes of local pioneers. In a word, these lands are a treasure for tourists. It is only necessary to plan the route in advance. Let’s do this together now to make your trip full of experience. If you are thinking which places to visit in Australia, be sure to include a landmark like Hillier Lake in your travel plan. The picturesque lake, which waters are of unusual pink color, is located on the Middle island, covered with dense eucalyptus forests. 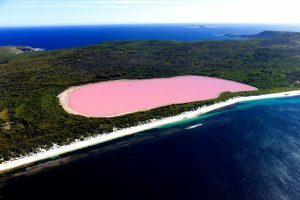 If you look at this island from a bird’s eye view, then against the backdrop of a rich greenery of eucalyptus forests there will be a little bright spot, this is the pink lake Hillier. Thanks to the frame of sand and salt, which are located on its shores, the lake looks even more spectacular. The status of the attraction of Australia Lake Hiller has got due to its eccentricity. Travelers from all over the world come to the shores of a unique lake to see for themselves that the water in it is really pink. What is the secret of this shade of water? Despite numerous studies, there is no exact answer. According to one of the versions, the pink color is formed due to the pigment released by certain microorganisms inhabiting the reservoir. 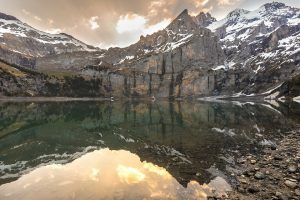 Another statement suggests that the pink shade is formed due to the combination of salts contained in the waters of the lake and specific microorganisms. Interesting: Studies conducted in the 50s of the 20th century disproved all previously proposed assumptions. Thus, the mystery of Lake Hillier still remains unsolved. 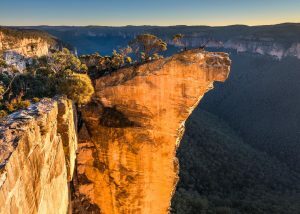 Fans of contemplating natural landscapes untouched by civilization will certainly find what to look at in Australia because on its territory there is a unique miracle of nature – the National Park “Blue Mountains”. This place has got its name not by chance. A huge number of eucalyptus forests growing on the mountain range constantly release into the air a pair of essential oil. The rays of the sun, refracted in billions of the smallest droplets of oil, form a bluish haze, creating an atmosphere of mysterious fabulousness. In the conventional sense, the Blue Mountains are not mountains. 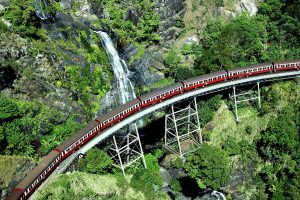 In fact, it is a set of mountain plateaus and cliffs, above which at a height Mount Victoria majestically rises about 1300 m above sea level. Interesting: Sandy plateaus, excised by gorges and canyons, are interspersed with a lot of crystal clear mountain rivers and streams, creating a surprisingly beautiful landscape. Not surprisingly, the national park has become one of Australia’s most popular attractions. South Australia is famous for its wine industry. And perhaps, one of the most spectacular wine regions here is the Yarra Valley, where many varieties of grapes grow. The first grape here was planted in 1838, since then more than 40 wineries have been formed on these lands, which today have excellent harvests. Thousands of connoisseurs of wine visit these fertile lands for tasting a luxurious bouquet of local wines. In addition, travelers can see here many more interesting things. 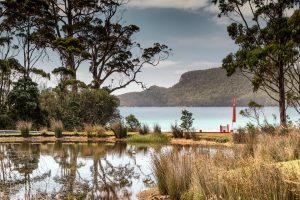 You can visit one of the many reserves that exist here, admire spectacular wildlife, see representatives of the local fauna, such as kangaroos, wombats, emu and some species of birds of prey. You can find a memorable thing in the markets of local small towns located in the open spaces of the valley. You can even take part in collective multi-day routes, in order to feel the local culture and learn as much as possible about the mysterious valley. 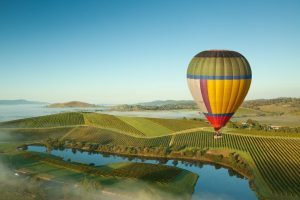 Interesting: To see the valley from a new angle, it is worthwhile to climb to the sky in a balloon, to sweep the expanses with a bird’s-eye view and to land in one of the many vineyards to have breakfast with fresh products, and drinking sparkling wine. The attractiveness of the Green continent is not only in the extraordinary nature of the continent. An important role is played also by the cities that have become centers of business and cultural life, where the most ancient sights of Australia coexist with modern skyscrapers, drowning in greenery parks – with lively avenues, historical museums, and huge supermarkets. 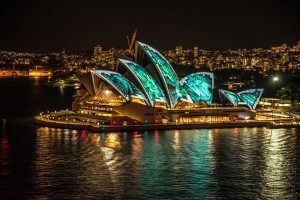 So, for example, the landscape of Sydney is uniquely recognized among thousands of other cities thanks to the world-famous sights – the Opera House, one of the most famous in the world architecture. This unique building was designed by a Danish architect named Jorn Utzon. Having designed original form of the theater roof, the Dane gave Sydney a symbol of the city, which now almost every inhabitant of the planet recognizes this city by. Many years after the construction of the famous building, the architect confessed that he was inspired by an orange peel, removed from the fruit by triangular segments. The difference is only in scale. The sloping roof vaults are covered with innumerable tiles, which, reflecting the sun’s rays, create an unusual color scheme. Interesting: Opera House has always attracted the attention of tourists by the uniqueness of its forms, in connection with which this architectural creation has become almost an integral element of any excursion to Sydney. Perhaps, everyone knows that for a long time the authentic symbol of Australia has been kangaroos. But not everyone knows that there is an entire island dedicated to this amazing animal, it is called – the island of kangaroo. On its territory a huge park stretches, inhabited by rare species of ancient animals and relict plants. The island was inhabited several thousand years ago by the aborigines, after which they left these lands, and all this time the lands remained completely isolated from the surrounding world, giving local animals the opportunity to live in complete tranquility and security. And only in 1802 the European Flinders set foot on Kangaroo Island, which gave such names to these lands. In addition to animals, visitors to the park are attracted by interesting geological formations – the so-called Wonderful Rocks, huge boulders of the most unusual and bizarre forms, located at a low altitude above sea level. Interesting: Not far from the Remarkable Rock there is another attraction of Australia – the Admiral’s Arch. This creation of nature is a cave inside a huge boulder, from the depths of which it is so interesting to contemplate the beauty of the sea tides. Located in the Red Center of Australia, the Royal Canyon once had the status of a sacred land for local Aborigines. Today, it gained the status of Australia’s attractions, thanks to its unique appearance and original natural beauty. Formed from sandstone sheer, walls of the canyon reaching 200 meters in height were formed for millions of years, acquiring unusual shapes under the influence of wind erosion. Inside the canyon, there are dense thickets of ferns and cycads, palm forests and shelter for hundreds of species of animals. This is due to the walls of the canyon, which for local flora and fauna play the role of protection from the desert drought that reigns outside the canyon. To the edges of the canyon, from which travelers get an amazing view, there are several rocky climbs. The most popular is the 6 km route, which will take about 3-4 hours. This is an optimal route, which allows you to enjoy the incredible panoramic landscapes of the canyon, to consider the unusual rock formations of the Lost City, and descend into the canyon itself – to admire the beauties of Eden Garden, the so-called pond in the rock surrounded by lush vegetation. 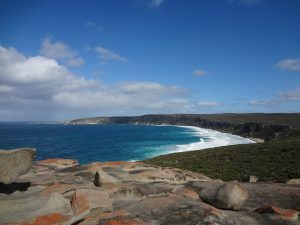 The easiest and shortest route takes place right on the bottom of the Royal Canyon, where you can see the numerous boulders and giant eucalypts, and this route ends on a viewing platform on the hillside, where you can see the steep cliffs. Interesting: Finally, the most difficult 22-kilometer route connecting the Royal Canyon and the city of Kathleen Springs can be conquered by the most adventurous travelers. To the south of the mainland there is another unique landmark of Australia – the island of Tasmania, famous throughout the world for its unique beauty of tropical forests. Surprising is the nature of the origin of the island – the continent of Gondwana, which existed on the earth several hundred million years ago, united the lands of future Australia, Africa, South America and Antarctica. As a result of the motion of the earth plates, the single continent gradually disintegrated into many parts, forming several separate continents, which preserved this form to our days. Interesting: The whole valley is replete with lakes, streams and mountain rivers – an amazing and spectacular sight will surely be appreciated by any traveler. Surprising in its beauty, the landmark of Australia in the form of an unusual rock formations was located in the west of the mainland. This rock “Stone Wave”, which name was due to its form – outwardly it is a miracle of nature looks as if a huge sea wave was stirred right in the middle of the land. Every year hundreds of thousands of tourists come to this stone statue. The visible part of the “wave” towering above the ground is about 15 meters high, and in length in length – more than a hundred meters. For many centuries this creation of nature played a big role in the culture of the local population. 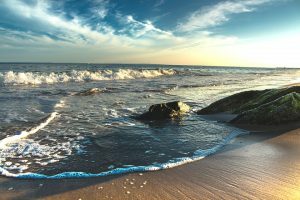 It was once believed that it was precisely in the place of the formation of this “wave” that the forces of spirits and nature gathered and interwoven. With special trepidation, Australians treat this statue up to this day, making great efforts to preserve the beauty of the natural monument. Interesting: For the preservation purpose, in the 50s of the last century, to strengthen the “Stone Wave” from natural erosion, a dam was built. For example, in local markets, you can not only purchase ordinary souvenirs, but also get to know the peculiarities of crafts and folk art of the indigenous people. Under a large net canopy, the world of Birdworld birds is located, where you can safely stroll among the hovering birds, including parrots, quails, pigeons, cassowaries. “Koala Gardens” is the name of a small zoo of the wild nature of the continent. In addition to koalas, there are kangaroos, crocodiles, lizards and snakes. The Aboriginal Study Center is a village inhabited by the true aborigines of the mainland. Here, you can fully explore the culture and way of life of the aborigines, watch their traditional dance, watch the boomerang or spear throw, listen to the game on the ancient African instrument didgeridoo. Interesting: In whatever corner of the Green Continent you are, you will surely be welcomed by the hospitable reception of the local population, and the nature of Australia will open in front of you a gateway to the wonderful world of tropical forests, crystal clear lakes, untouched lands far from the everyday routine and bustle of modern civilizations. The Harbor Bridge is one of the main attractions of Sydney. Townspeople jokingly call it “Hanger”. 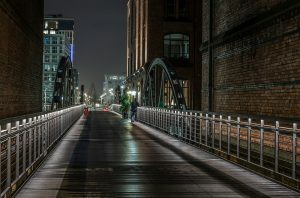 The opening of the bridge took place in 1932, he connected the previously isolated parts of the city to each other. The total length of the bridge is 1149 meters, width – 49 meters. With a weight of 52,800 tons, the Harbor Bridge towers over the sea for 139 meters and fits seamlessly into the modern architectural appearance of Sydney. On one of the spans there is an observation deck Pylon Lookout, using which tourists can see the circular panorama of Sydney – from this point you get excellent photos and videos. Lookout Pylon Lookout – one of the most popular places among tourists. Interesting: Since 1998, for those who wish, excursions are made to the top of the bridge along its side arch, from where breathtaking scenery opens.